Micro-Vibration Therapy™ (MVT) is a unique and patented technology that merges four separate therapy technologies into one powerful device: the MVT Relief. The results are truly revolutionary. The Micro-Vibration Therapy™ in the MVT Relief synergistically combines the tested sciences of micro-vibration massage therapy, light therapy, sound therapy and magnetic therapy together to create a powerful union of therapy for physical relief. 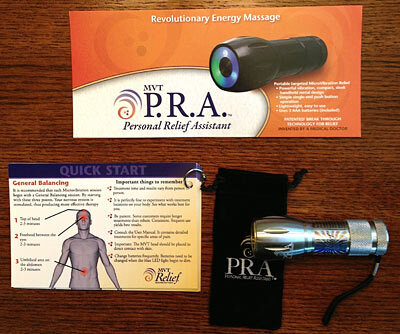 We believe that the MVT Relief will become an important tool in Energy Medicine - the medicine of the future.